The folks over at Fuel Games have finished working on a new version for their beta of Gods Unchained, and this update brings many interesting changes and fixes to the table. There are little improvements all across the board, but we have compiled only the important ones, sort of an all killer, no filler summary. An important thing to note is that thus far the developers have been working in four-week development cycles, followed by two weeks (or more) of quality assurance. This update marks a shift there as well, since now they will be cycling between two weeks of development and two weeks of quality assurance. Simply put, updates will be more frequent. This update brings a HUGE amount of new cards. There are now almost 550 cards live, which is 66% more cards than the previous release. Many cards had their text rewritten in order to make them clearer. -There are new card keywords: Soulless, Deadly, Confused, Hidden, Flank, Protected and Burn. Speaking of which, hovering over a card will bring you brief explanations of its keywords. Cards can now attack multiple targets. New filtering options have been added to improve the Deck Builder. A Collection page to track your progress has been added. You can now access the settings menu at any point during a match (this doesn't stop the turn timer). Several quality of life improvements, including card previews, a cancel option in the matchmaking screen, tribe labels and a bigger cursor. New visual effects and textures. New in-game and main menu music. These fixes and updates come from their users feedback. The dev team says that they’ve fixed more than 1,500 bugs since they first released the closed beta. That’s a shitload of bugs, and Gamie finds them repulsive. 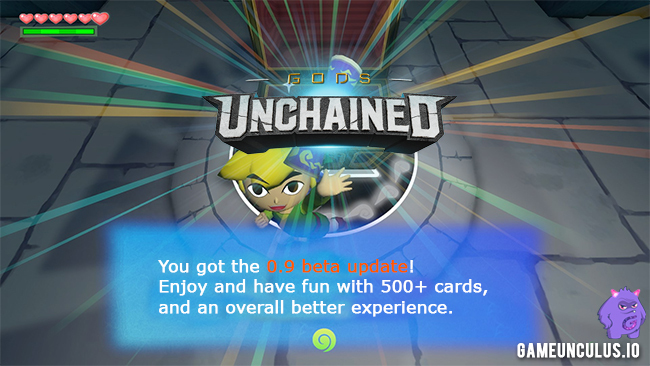 Thankfully, the Gods Unchained team has been hard at it, solving all sorts of bugs and hiccups that the beta has had. None of these changes will turn your Gods Unchained experience upside-down, but that’s understandable since there’s a lot of work already done on the game. What this definitely does, however, is expand the game. More cards to try out, more keywords to add new things to the meta, and several other fixes.